Sometimes a dog is much more than a pet - she's a lifeline. That's the case for 53-year-old Harry Brown and his pup Olivia. Diagnosed with terminal pancreatic cancer, Brown, a homeless former Marine, relies on Olivia for comfort, help and companionship. She's his best friend. Brown had been taking Olivia on a trip to say goodbye to all his friends and family. Earlier this month the two were in Long Beach, California. 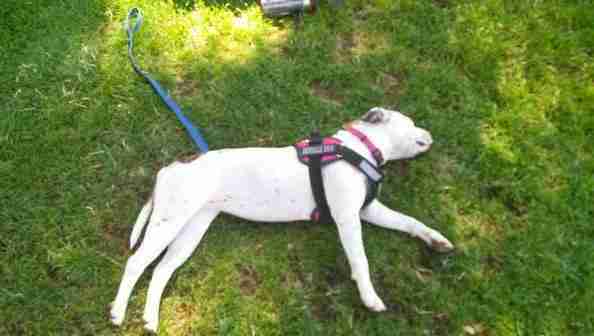 Brown stopped to nap on a park bench and when he woke up, Olivia was nowhere to be found. Distraught, Brown began looking everywhere for her. When he couldn't find her nearby, Brown walked from Long Beach to Orange County to search for her in shelters, NBC Los Angeles reports. After five days of looking, Brown was heartbroken. He had to catch his ride to Phoenix, Arizona, which meant leaving California without Olivia. 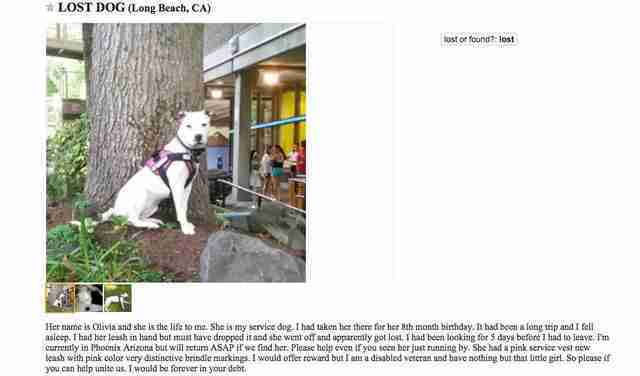 Brown posted this lost dog ad on Craigslist, hoping someone would see it and help him find her. "Her name is Olivia and she is the life to me," it said. "I would offer reward but I am a disabled veteran and have nothing but that little girl. So please if you can help unite us. I would be forever in your debt." Once he was in Phoenix, Brown gave up hope that he would ever see Olivia again - he even gave away her bed. But everything changed one day when Brown saw an email from someone back in California that said, "Your girl is in L.A. County, go get her." That's when the magic really started - Captain Care, an L.A. rescue group, took up Brown and Olivia's cause. 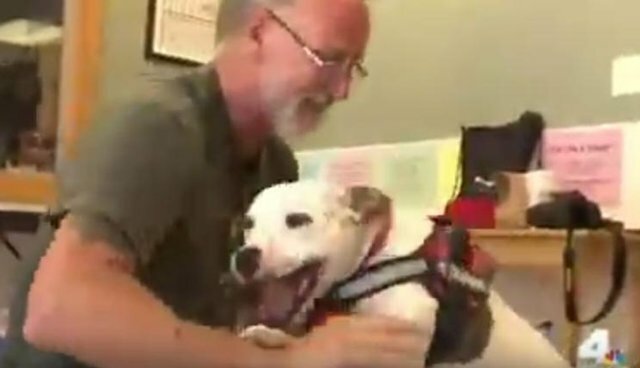 Their volunteers raised money to bail Olivia out of the county shelter where she was being held, they bought her a new bed and lots of new toys and paid for Brown's bus ticket to Long Beach and a hotel room once he got there. Back in L.A. to be reunited with Olivia, Brown posted a joyful update on his Facebook page. "Today I say with a beautiful heart I am truly in the City of Angels," he wrote. "The last two days have been mind boggling as her and her many amazing friends helped get me back here to reunite with my love. In just two hours I'll be basking in her love and kindness once again." Brown and Olivia had a tearful reunion - and, thanks to all their new friends, she got spayed and got her vaccines before they left L.A.
Now the two of them are on the road again, continuing Brown's journey of goodbyes. While he still faces many challenges, Brown wrote on his Facebook that he is a "happy man" because he's back with his girl.